Natural evolution of the Dual Band, the Dual Band plus brings some features until today available only on the En-Joy model (wireless joystick). 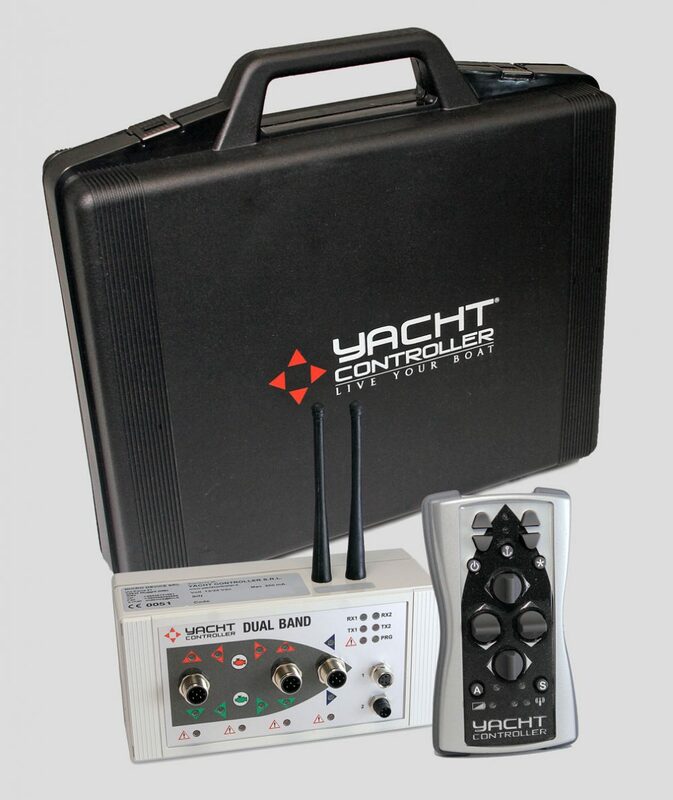 Yacht Controller Dual Band Plus is equipped too with a double band of transmission that transmit simultaneously on both bands to avoid any interference caused by the presence of any nearby devices, not compliant with the law. Two flashing LEDs on the transmitter show you when you are transmitting on the two separate frequencies. 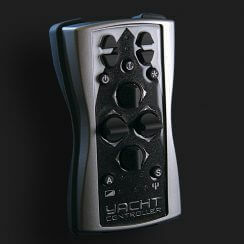 On the transmitter there’s the button that allows, with the receiver switched on, the engage. 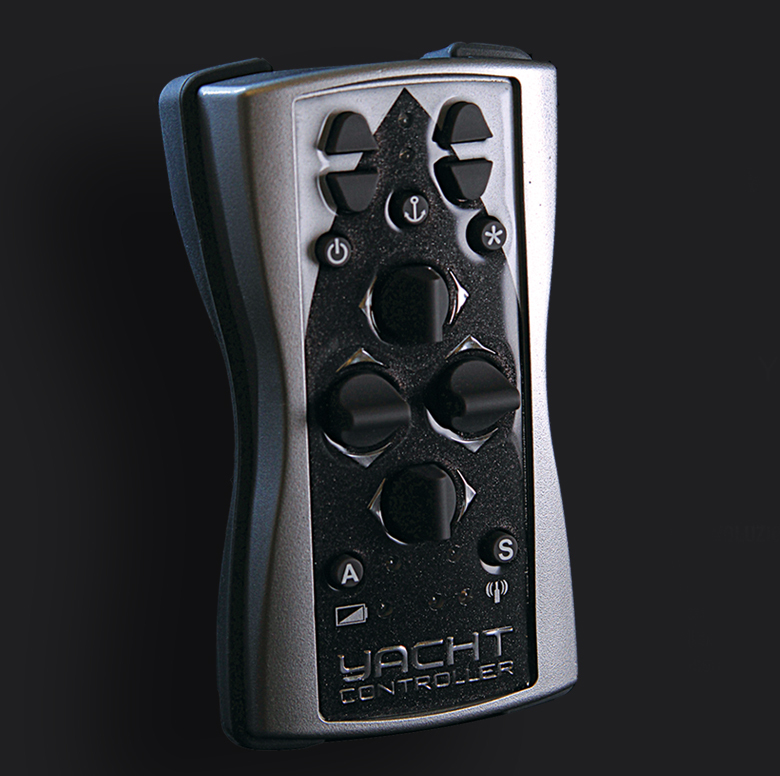 In addition, he also adopts the special silicone membrane levers, guaranteed for over 200,000 movements, to simultaneously control the two engines, the stern and bow thruster and the anchor winch (eventually a second winch option is also available), for an easier and safer mooring. The transmitter is water resistant and floating. The battery compartment on the back, also watertight, makes it quick and easy to change the three AAA batteries, easy to find wherever you are. The receiver working on two different bands of frequency ensures the perfect operation even in case of external interference or failure of one of the bands. The multiprocessor structure (a central CPU and a microprocessor for each function) and the double relay for each output command allow a double control of each function, making unwanted commands impossible. 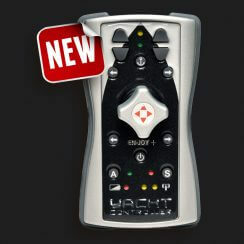 Also in Dual Band Plus the design is modular, and can be easily modified to add new functions. 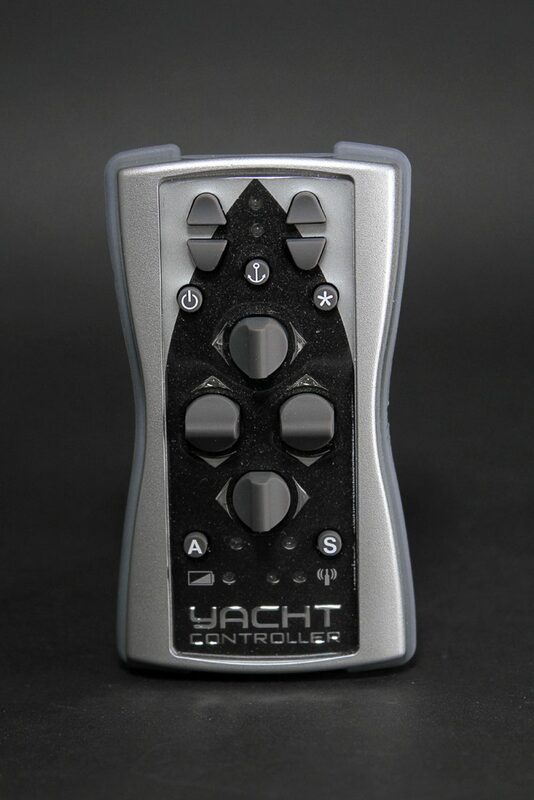 If the owner purchase a new boat it won’t be necessary to purchase a new Yacht Controller but simply to replace a module in case of different control heads. 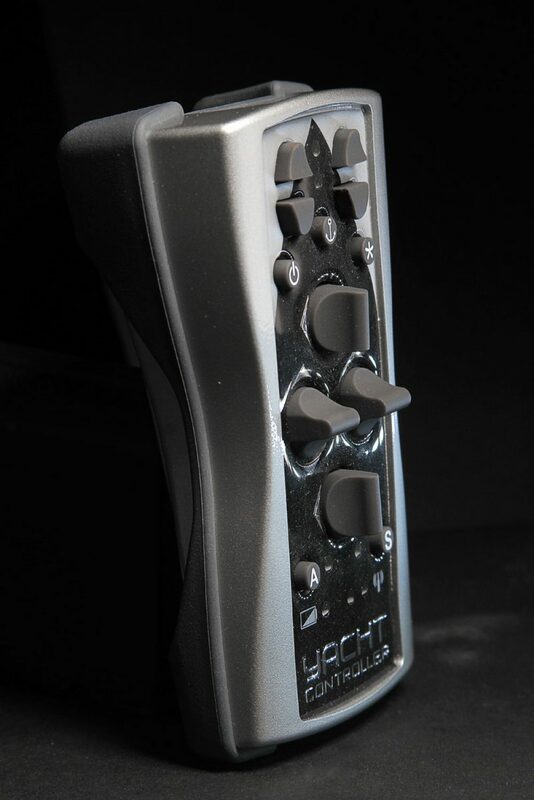 The leds on the front panel of the receiver report the correct functioning of the electronics, the status of the active commands and, in case of malfunction, the type of failure. The beeper indicates not only the loss of the connection with the transmitter but also the different states of operation and alarm. 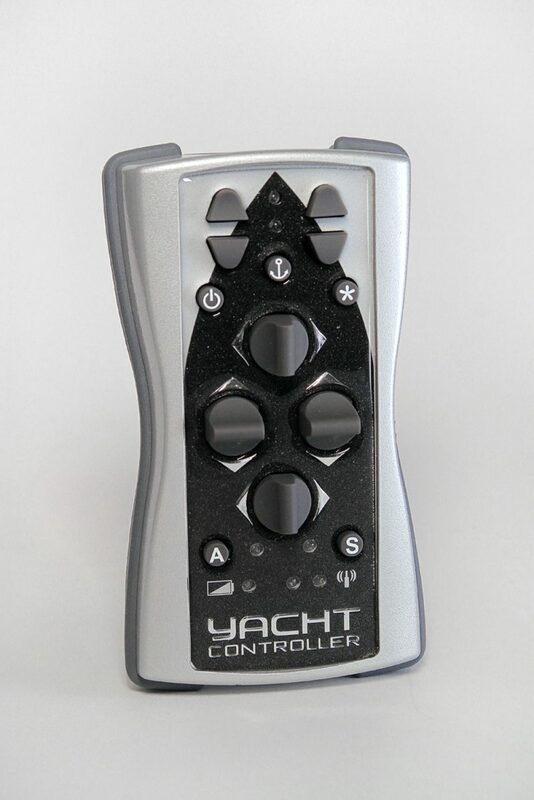 The Yacht Controller Dual Band Plus adds to all this also the “Acceleration” option and the “automatic” option, where engines and bow and stern thrusters can be used simultaneously, the possibility to connect two different anchor winches while maintaining the chance to integrate the product with the Yacht Controller Dual Band, En-Joy and JCS Plus. 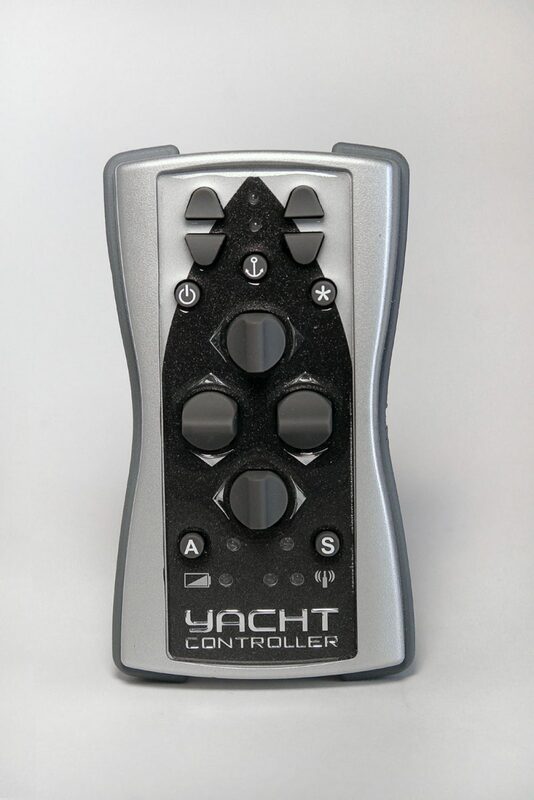 The electronic control levers of the boat must be positioned in neutral, enable the Yacht Controller receiver using the switch on the dashboard and switch on the transmitter Yacht Controller Dual Band Plus, and press the engage button on the transmitter. From now on the system is operational. To operate the engines and the bow and stern thrusters it will be necessary to keep the levers pressed in correspondence with the desired direction. 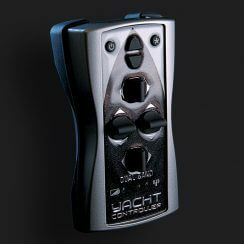 To activate the anchor winch, simply press the buttons corresponding to the desired functions. To activate the acceleration function, just press the “S” button. There are 5 different acceleration profiles that can be customized upon customer request. 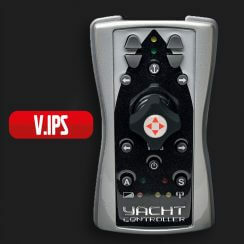 Moreover, in case of adding a further receiver , it will be possible to activate other functions on the vessel, such as gangways control, automatic doors, etc. 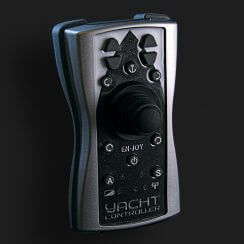 Removing the pressure from ANY lever, the system will return to “Neutral” mode. 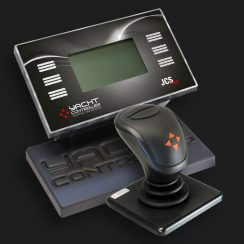 your Control Head brand written here.